The University of Scranton is proud to be located in Scranton’s Historic Hill Section. In addition to the University, the Hill is home to the three major hospitals that serve the Scranton area, two elementary schools and Nay Aug Park. It has a diverse cross-section of Catholic, Eastern Orthodox and Jewish religious institutions and communities and many stately Victorian homes built around the turn of the 20th century. 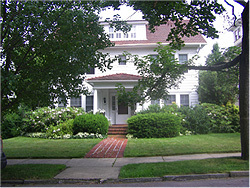 Tree-lined streets and wide front porches create a friendly neighborhood feeling. Founded in 1888 as Thomas College, The University of Scranton was renamed in 1938 and relocated from Wyoming Avenue to its current location in 1940. 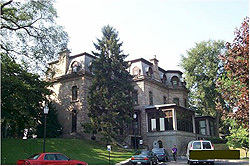 In December of that year, the Scranton family donated much of their family’s estate in the lower Hill Section to the University, including the mansion which has come to be known simply as “The Estate” and is home to the University’s Admissions Office. Since 1940 the University has greatly expanded its campus and presence in the Hill Section. Today, many of its upper-class undergraduate students live off-campus in the Hill in private apartments. Faculty and staff have purchased homes in the Hill through the University’s employer assisted housing program, which aims to aid Hill revitalization efforts. The University also owns several rental properties located in the Hill Section that are specifically designated for renting to students, faculty or staff. We invite Hill Section neighbors to participate in the many lectures and discussions, cultural events and performance that take place on our campus and to make use of other free University resources, such as the Weinberg Memorial Library.